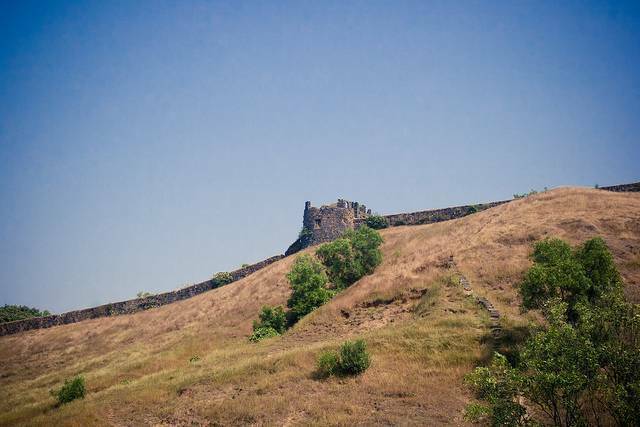 Korlai fort also called Castle Curlew is a Portugese fort in Korlai, a small village in Maharashtra. The ruins are maintained well and are interesting. The best part about this fort is that the climb is not very grueling as it is situated on a fairly small hill. It’s a pleasant surprise that it is quite untouched and unexplored even though it is close to Mumbai. The view from the fort is simply superb as it is covered by sea on three sides. It’s an amazing spot to see the sun drown in to the sea from. It overlooks the wonderful sand of the Korlai Beach which also houses a light house. The fort is linked to the light house by a flight of stairs. The beach is small yet clean and beautiful. This makes for a perfect family get away. You are advised to carry some food and water along with you as it is quite desolated.